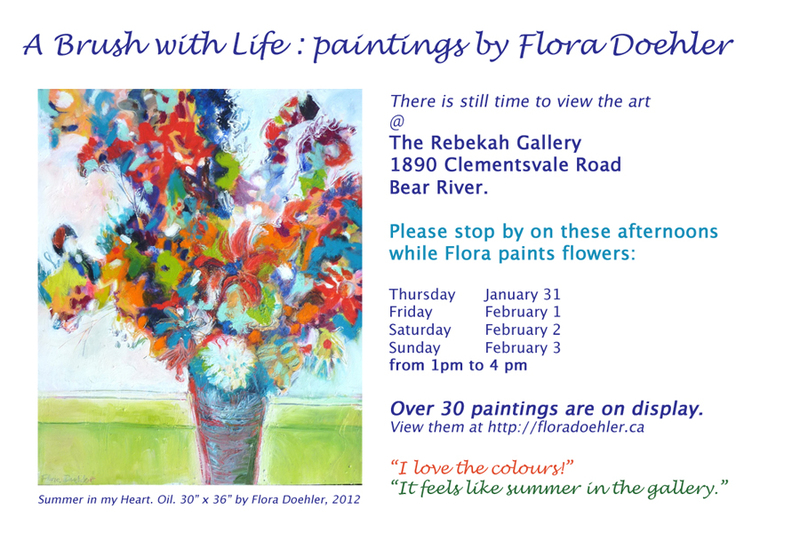 Watch me Paint at the Gallery, surrounded by more Paintings! The opening for my painting exhibition was fantastic! Lots of people came to take a look, many having to travel through ice and snow to get there. It was a thrill to talk to people about my Nova Scotia work and wonderful to find new owners for some of the paintings. The show will be up at The Rebekah Gallery for the next few days and closing at 4 pm on Sunday, Feb 3. I’ll be there for 4 afternoons starting tomorrow, Thursday Jan 31, 2013. I have a gorgeous bouquet of flowers to paint and you can see how I work and what materials I use. If you haven’t had a chance to visit the show yet, or if you would like to view it all again before the show ends, please join me. Over 30 paintings are on display. Here is a video to give you a better idea of the size of the paintings. What amazing work Flora. I wish I could come and watch you paint. Lovely, strong and powerful work. Superb. I started that tulip painting several years ago, then picked it up and painted more on it a couple of years ago. I still wasn’t satisfied so last year I mixed a neutral colour from several of the tulip colours plus white and painted a flattish background. I think this makes the flowers ‘pop’ and helps define them. Some paintings don’t require a lot of revision and others take a few years until it’s at the point where I feel it is finished. We sure would. And I am so proud of you having a solo show!!!! So fantastic. You rock girl! I was so glad you posted it so I could enjoy, even from far away! The Brier Island pictures brought me right back to summer in NS!